The operation and performance of electronic systems depends on the accuracy of timing signals. For decades, these signals have been generated by quartz crystal oscillators, which cannot be integrated into microchips. A lot of efforts have been dedicated to the realization of integrated frequency references, resulting in various types of silicon-based frequency references. Some combine a MEMS (Micro Electro Mechanical System) resonator with a silicon chip, while others rely on integrated resistors, capacitors, or inductors. This book describes an alternative approach to the realization of integrated frequency references. Unlike others, it does not rely on the accuracy of on-chip electrical components. Instead, it relies on the thermal properties of bulk silicon, harnessed by electrothermal structures. The operation of such structures is governed by a physical parameter: thermal-diffusivity, a measure of the rate at which heat diffuses through a silicon substrate. 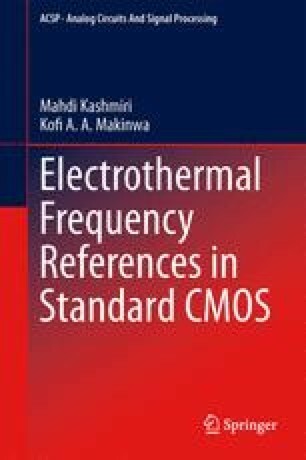 This book shows various standard CMOS prototypes with output frequencies up to 16MHz and stabilities of ±0.1% over the military temperature range (-55°C to 125°C). Realizations in scaled processes show that electrothermal frequency references benefit from CMOS scaling.